Have you been diagnosed with Parkinson’s Disease, PSP, Lewy Body Dementia, MSA or other movement disorders? Have you had some physical therapy or maybe none at all but heard that you need to exercise and move your body daily in order to keep the symptoms of your disorder from getting worse? Do wish you could get more exercise and know you need support and guidance with what would help you the most? First, see one of our knowledgeable neurologic physical therapists if you have not checked in with PT in awhile or never…Then check out PWR! And PWR! Boxing Class! At ExercisABILITIES, we follow the most accurate and latest research in exercise and therapy. 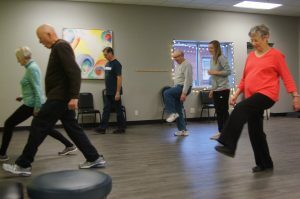 We believe through experience that physical activity and exercise can slow the progression of the symptoms of Parkinson Disease and other movement disorders. Initial and periodic Physical Therapy (PT) evaluations are essential to get a baseline in your function, balance, and mobility safety as well as to get important education about you and your movement disorder. We recommend an initial bought of PT to learn important safe mobility, tuning up to prepare for lifelong health, and to learn exercise basics. After this, we recommend yearly check-in with your PT or as needed with changes in your mobility and movement control. We offer PWR! And PWR! Boxing classes up to 8 times per week for varying levels of safety and abilities. PWR! classes are research-evidence based and proven to slow the progression of PD symptoms when performed at least 3 times per week. Our exercise specialists will lead you through special BIG movements that will get you moving and feeling better from the very first class. 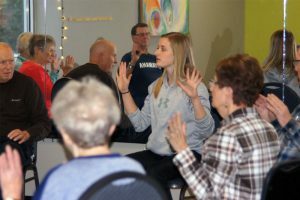 You will see that you will gain more energy, have improved voice volume, move with less stiffness and stopping, and improved safety from falls just to name a few of the benefits. To participate in the PWR!, contact us for your Free Fitness Assessment today!